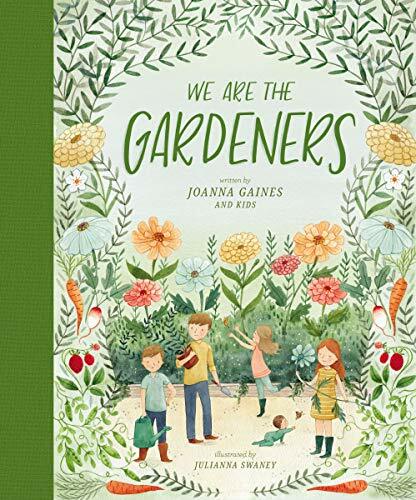 In We Are the Gardeners, Joanna and the kids chronicle the adventures of starting their own family garden. From their failed endeavors, obstacles to overcome (bunnies that eat everything! ), and all the knowledge they've gained along the way, the Gaines family shares how they learned to grow a happy, successful garden. As it turns out, trying something new isn't always easy, but the hardest work often yields the greatest reward. There are always new lessons to be learned in the garden! You and your children can learn all about the Gaines family's story of becoming gardeners in Joanna's first children’s book—starting with the first little fern Chip bought for Jo. Over the years, the family's love for gardening blossomed into what is now a beautiful, bustling garden. Julianna Swaney’s illustrations bring the Gaines family garden to life with colorful, whimsical watercolors and invite you to enjoy the beauty of a thriving garden.